Carlton Fisk was born in Bellows Falls, Vermont on December 26, 1947 and grew up in the small town of Charlestown, New Hampshire. From an early age, Carlton was given the nickname "Pudge". Growing up in New Hampshire, Pudge's childhood dream was to become a professional basketball star with the Boston Celtics! A natural athlete, he excelled in all of the sports on a high school level (Baseball, Basketball, Soccer, etc.). In 1967, Carlton was drafted by the Boston Red Sox during the first round. He began his professional baseball career in the Red Sox minor league system—first with the Waterloo Hawks in 1968 and then the Pittsfield Red Sox in 1969. At the end of that year, Pudge was called up to the big leagues and made his major league debut at Fenway Park on September 18, 1969. He played the 1970 year with the Pawtucket Red Sox and finished his minor league playing days with the Louisville Colonels in 1971. 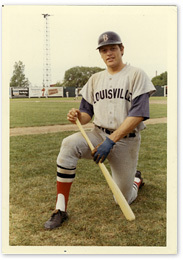 Pudge was once again called up from the minors at the end of 1971 and earned himself a place on the 1972 Red Sox Spring Training Roster. As history would have it, Fisk broke into the major leagues (to stay) early in 1972. Carlton went on to become the first individual to be unanimously named Rookie of the Year in 1972, along with winning a Golden Glove award, and also leading the league in triples. This first full season marked the beginning of one of the most successful careers in baseball history. Most commonly remembered for the 1975 World Series (Boston Red Sox vs. Cincinnati Reds), Fisk left an image on all baseball fans with his dramatic 12th inning homerun to win the Sixth Game of the World Series and extend the series to seven games. Carlton played with the Red Sox through the 1980 season and then "changed" his sox and finished his illustrious career with the Chicago White Sox, playing all the way into the 1993 season. When Pudge retired, he held many records, including Most Homeruns for a Catcher (351) and Most Games Caught (2,226). Elected to the Baseball Hall of Fame in January 2000, Fisk is one of the greatest catchers to ever play the game of baseball.